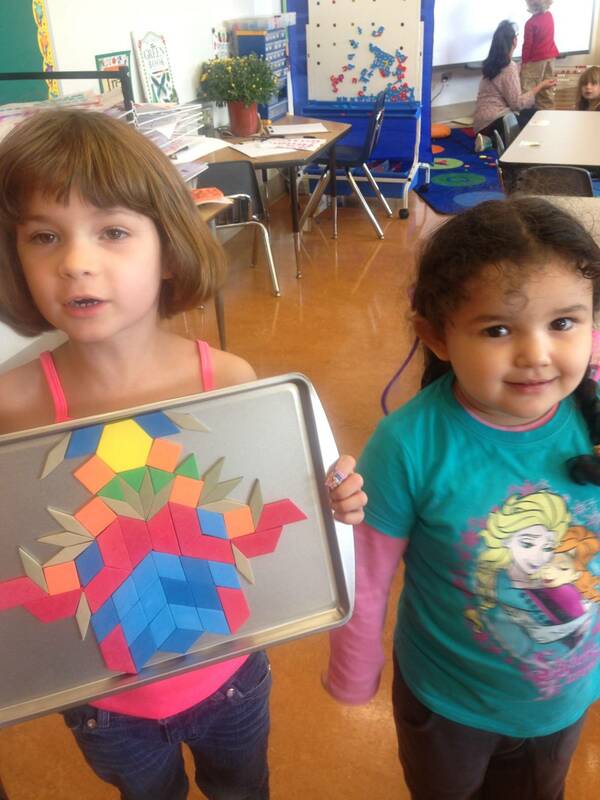 KQED Mindshift: Why Spatial Reasoning Is Crucial For Early Math Education - "The National Council of Teachers of Mathematics (NCTM) recommends that spatial reasoning should be a large focus of preK – 8th grade math education." h/t @dianamaps. The History of the World in 40 Objects - The site is story map that manages a set of related story maps. The application was presented by Kate M. Craig, Assistant Professor of History at Auburn who developed it with her students, at the American Historical Association’s Annual Meeting! She shares a guide for historians on how to replicate the structure of this project along with her assignment templates and rubric. University of Southampton News - Researchers from the University of Southampton and the Sweden-based Flowminder Foundation found that by combining mobile data and geospatial data from satellites, they were able to produce poverty predictions which are comparable with those made from traditional sources, but with significant advantages. The research is published in in the Journal of the Royal Society Interface. via . SomethingAboutMaps Blog: Financial Transparency - Can you make a living teaching about maps and making maps as a freelancer? Daniel Huffman shares some details about his map making career. Fulcrum is offering Fulcrum Community, a crowdsourcing platform, for humanitarian and other service (non-commercial) uses. It's in beta and data are anonymized. Education is not mentioned specifically, but many education service projects might fit. Google swaps Terra Bella (Skybox) for equity stake in Planet Labs. Hard to keep track of the players without a scorecard! Fair Housing [and mapping to support it] Faces an Uncertain Fate per CityLab. I noted the proposed legislation in a previous newsletter, but this article provides context. In January, the National Trust for Historic Preservation announced it had received $50,000 from the National Park Service’s African American Civil Rights Grant Program to create a GIS-cultural map of the Rosenwald schools. Mr. Rosenwald, a partner in Sears Roebuck, funded about 5000 of the schools across the south between 1913 to 1932. Francesco Nex, assistant professor at the ITC Faculty, University of Twente recently taught photogrammetry for an applied drone mapping at INES-Ruhengeri Institute in Rwanda, along with his colleagues Rohan Bennett, and Anton Vrieling. There's a shortage of maps and surveyors in the country. I noted routing based on accessibility for wheeled visitors at the University of Kentucky. The University of Washington is taking the lead and working to create standards on OpenStreetMap for the required data. Ten cities, including Boston, are on the list to be mapped. Helena Mitasova professor of marine, earth and atmospheric sciences at NC State, and associate director of geovisualization in the Center for Geospatial Analytics, is behind the Tangible Landscape project. It allows researchers, urban planners, ecologists and anyone involved in managing the land can get real-time feedback about how their projects might affect landscape processes. Via NC State news. Texas A&M University’s Cushing Memorial Library and Archives invites visitors to explore fantasy maps with the new exhibit, Worlds Imagined: The Maps of Imaginary Places Collection. Student enrollment in online classes at Edgecombe Community College, NC is up! The college offers six programs in which students can earn a two-year degree entirely online: Accounting, Business Administration, Geospatial Technology, Health Information Technology and two College Transfer programs, Associate in Arts and Associate in Science. The University of Delaware Library will present three workshops during the spring semester featuring PolicyMap, ArcGIS Online and ArcGIS for Desktop. The workshops are free and school community members can use the library resources. In collaboration with Ball State University’s GIS Research and Map Collection, Cornerstone Center for the Arts in Muncie, IN will host a Mapping Black History workshop at 6 p.m. Feb. 28. The presentation will use historic and modern maps to display the important people, places, civil rights legislation, and other events locally, nationally and internationally relating to Black history. USGIF offers scholarships for graduating high school seniors, undergraduate, graduate, and doctoral students. Deadline: May 15. Esri announced the winners of the the Global Content Challenge; details in ArcWatch. I saw this on Twitter. Would you download it? Why? Why not? Is the source authoritative? What's the tweeter's motivation in sharing this e-book? My responses are below the graphic. I'd be skeptical. The download is promoted by Geospatial Careers, @geojobsbiz on Twitter, part of Spatial Media LLC. 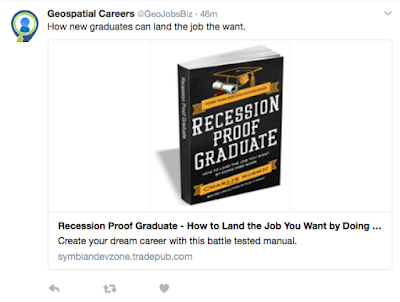 GeoJobsBiz sells employment ads. It also makes money by promoting books and publications like this via social media in partnership with a company called NetLine. Spatial Media (or perhaps Geoaptial Careers) gets paid each time someone submits their contact information to download the free book. The 82 page book, from 2009, is provided free by Charlie Hoehn, who wrote it. Remember, if the product is free, you are the product!